Foggy start to the first full day of summer, but views from second summit finally materialized. Eagle Saddle trail in good shape. We hit snow between first and second meadows around 5200' which continued up till the final switchbacks on route to the saddle. 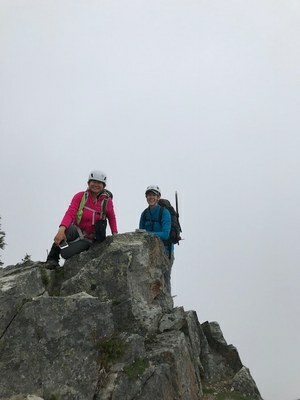 At this point, we were in the clouds, but elected to head first to Eagle, where the rock was dry, but views were non-existent. Ledges route was straightforward and the team did well here. We all remarked that the descent seemed easier than we had anticipated. Back at the saddle, we still had plenty of energy so headed towards Chutla. Given the snow down low, we had not noted the way trail as mentioned in the 100 Peaks e-book, but we followed our way along the true ridge, threading many trees, and some rocks. Below the summit, there is still a good amount of snow, and utilized ice axes and micro-spikes for the final push. After a lunch and group photos, who should come out but Rainier? Hence, more photos. In fact, the trail back down through the forest felt so changed, from the mist of the morning, to the blue sky of the afternoon. Great day to be out, and a great crew to spend the day with!